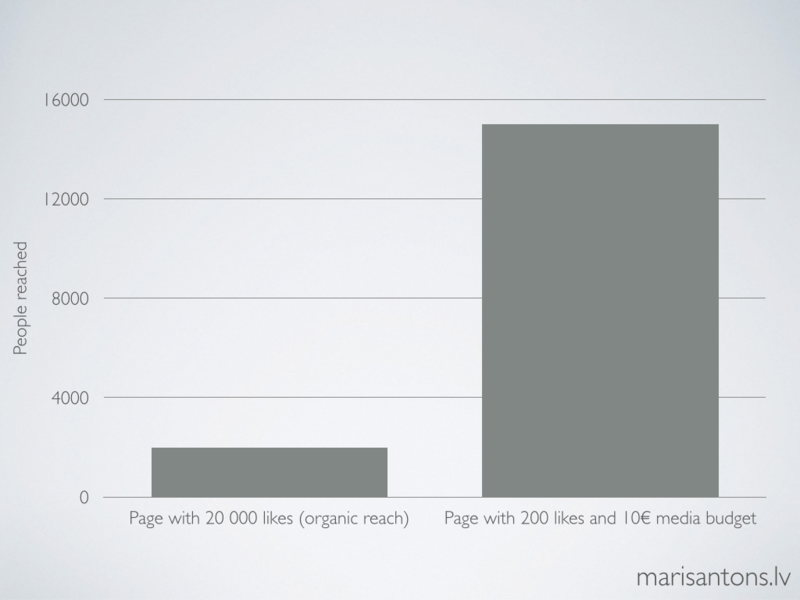 Number of likes is still one of the numbers that advertisers look at when evaluating their success on social media. Sure, it can be used, but it has lost any long-term importance. To visualise this I will simply show a picture that shows how many people you can reach through a page with 20 000 likes (+ no media budget) and how many people you can reach with page that has 200 folowers and using 10€ (~$11) media budget. Due to EdgeRank and other things this is now reality. This data is from real clients and is consistent (in the case with organic reach even optimistic) with industry’s benchmarks. Media budget example is from Latvian market and can be different in other markets. But the trend is clear – a few bucks outweigh the effort that has been put in building facebook fan base over years if you want to deliver one specific message to as much people as possible.